Join the discussion on our forums! Come discuss Oblivitron over in our dedicated Oblivitron discussion topic. 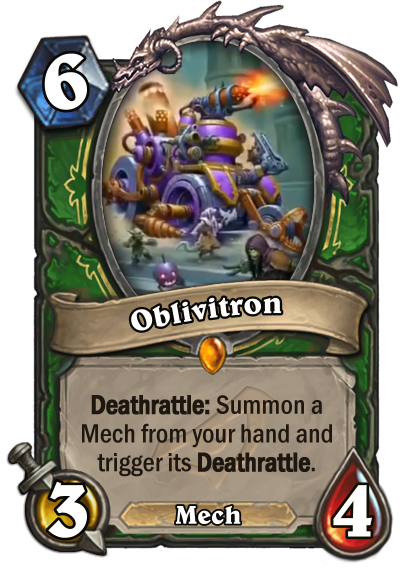 Deathrattle: Summon a Mech from your hand and trigger its Deathrattle. Spider Bombs, Spark Drills and Kaboom Bots, the Pinata, Sky Golems, Mecha Whelps and Sneeds. and returning this with a 3 mana spell to your hand while triggering it and potentially pulling itself out. This one'll be a party!